Writing for Stratfor, one of its leading analysts Reva Bhalla probably feels obliged to mix fact and fiction, news and opinions, to offer us a “deeper understanding” of the Syrian civil war. He for example kicked off his recent-published Stratfor Geopolitical Weekly article on Syria with the question of why, after the UN invited Iran to participate in the coming Jan 22 meeting in Switzerland, aimed at a possible settlement within rebel factions and between them and the Syrian regime of al-Assad, the Syrian rebel representatives could so quickly and successfully push for the Iran offer to be rescinded. Bhalla asks, naively or not, disingenuously or otherwise why such an inauspicious start for a diplomatic settlement should not also mean a settlement is impossible. Why should any effort ever prove fruitful? He only has to look at the chart above, included in the article under his name! Stratfor provides us a well-padded mix and mingle, and essentially comes to no conclusions. It also provides plenty of plain old factual errors, but this is not really important – because we already know that “Syria” as a nation state with a national identity and national history never, ever existed. Should we be surprised, let alone concerned that a non-nation is at this moment disappearing? Or maybe we should call Ghostbusters to help remove the phantom? There are good reasons for deep skepticism, which Stratfor is obliged to at least partly cite. Syrian President Bashr al-Assad's forces continue their three-year fight to recover ground against the increasingly fratricidal rebel forces engaged in a “turf war” scrumdown with occasional billed and paid photo opportunities, for Paris Match and Der Spiegel, and other leading newsmags, of village beheadings in the open air. The rebel rabble is backed by sunni Saudi Arabia and its Gulf state neighbors also ruled by minority sunni regimes, and opposed by shia Iran and Putin's Russia. Arms vendors, like France, have hurried to get their hands on the petrodollars falling from the Saudi banquet table, to keep the bodycount high, and profit for as long as oil prices remain at unreal and unrealistic highs. Arms business is business for the French, “the country which invented Human Rights”! The big deal, we are told, is that Bashr al-Assad will “concede power to sectarian rivals at the behest of Washington”. This is made (very) theoretically more likely by the United States already negotiating with Iran. An old classmate of al-Assad's from his London days as an ophthalmology student, Ali Haidar, formerly an anti-Assad “loyal opposition” figure, and now Syria's minister for National Reconciliation, however told news wires that Geneva-anything, whether I, II, III or X could never solve the Syrian crisis. Bhalla reported him as adding that only “military triumph of the state” will prevail. Widespread pessimism, like the doctrine of “endism” is chic and fitting in a period of cultural degeneracy, political inertia and a refusal to ever act – until crisis point is reached and exceeded - which for Syria means a return to what it has always meant. In the few decades it ever existed as a pseudo-nation state this meant internecine fighting. Never mentioned by Bhalla in his Stratfor briefing, the age-old cult status of Alpha Male freedom fighter and clan defender is alive and well in what is temporarily called “Syria”.Whether Hizbollah, Druze, Kurd, Palestinian or any other faction-player, the recognition of a Central State and Nation is anathema. It does not exist. The Alawite recognition of Damascene power by al-Assad is only and strictly due to benefits received. Nothing else. Under this heading, Bhalla for Stratfor goes much too far in casually ignoring the real world. Firstly Stratfor ignores the deep-seated will to fight. Also, western organizations like Stratfor or analysts published by organizations like Stratfor, feel able to ignore that local internecine fighting has a solid economic basis and well over 1000 long years of tradition. The French term for the region – The Levant – was coined to signal the fertile, growing, crop raising, agricultural, viticultural and oleaginous richness of the region in Antiquity and today. With the Roman Empire, for example, the region always ran a trade surplus. Today it can pay for the AK47, grenade launchers and Toyota Hilux of its internecine fighters, defending their turf to the total exclusion, and to the death of all others. The handwringing plea by Bhalla is that inability to end the fighting leads to the forced conclusion “that Syria is doomed either to break into sectarian statelets or, as Ali Haidar articulated, revert to the status quo”. Under this very improbable status quo scenario, the Alawites would regain full control and the Sunnis and everybody else would be forced back into submission. Bhalla has to admit this is a ludicrous lame duck conclusion. He says both scenarios are “flawed”. He says that just as international mediators will fail to produce a power-sharing agreement at this stage, and just as Syria's ruling Alawite minority will face extraordinary difficulty in gluing the state back together, there is “no easy way to carve up Syria along sectarian lines”. Goodbye Syria! Before the 1916 Sykes-Picot agreement traced out an impossible or at best “awkward assortment” of new nation-states in the Middle East, the name “Syria” only referred to a stretch of land enclosed by the Taurus Mountains to the north, the Mediterranean to the west, the Sinai Peninsula to the south, and the Arabian desert to the east. The very weak, even laughable arguments advanced by Bhalla for Stratfor that “Syria” has a reason to exist are forced to cite the Hellenistic Seleucid dynasty, based in the city of Antioch (today in Turkey) from about 300 to 140 BC. Another brief and fleeting existence for any entity somewhat comparable to the “Syria” of today, during the Umayyad Caliphate, was based on Damascus from AD 661 to 749. Stratfor is not in the business of admitting reality, so the simple fact Syria never existed is not cited. We are however told that Syria was “often divided or subsumed by its neighbors”, because as a nation it was too weak, or too fragmented, or too vulnerable to exist. This is admitted by Bhalla to be the fatal role of a “borderland” with no hinterland or center. A frontier state between other states – which in the Sykes-Picot world never really existed. 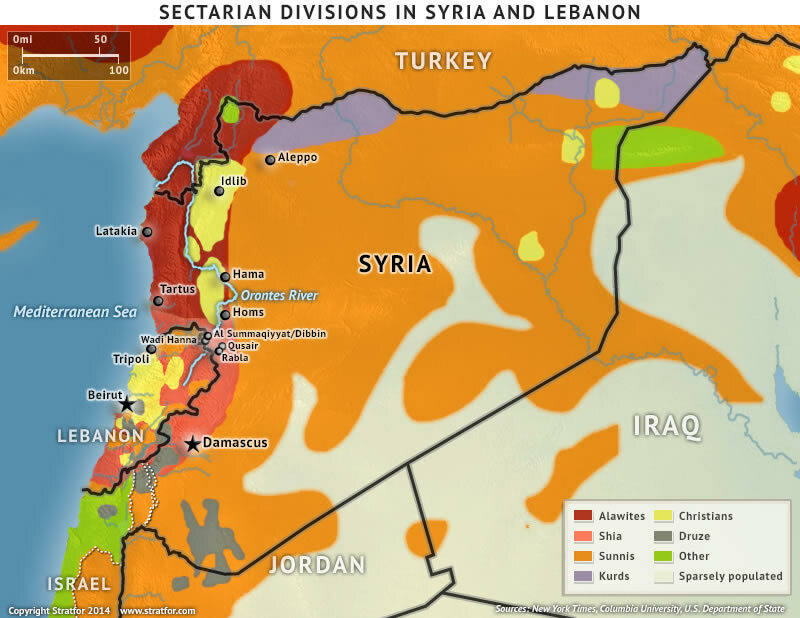 We are told by Stratfor about the obsession of Syrian leaders, in the few decades the nation was forced to exist, about its lack of coastline and the need for a large coastline “to participate in sea trade and guard against (maritime) powers”. This is an argument that does not seem to persuade Putin's Russia with its not-large but highly symbolic Tartus naval base on the Mediterranean coast – in Syria for as long as it exists! Obligatorily cited by Stratfor and other analysts, Russia has a plain and simple reason to want the country to exist – for its geopolitical projection into “the warm sea” of the eastern Mediterranean. Stratfor is forced to acknowledge one major factor making it very, very difficult for any outside power to “get rid of Syria”. It explains that Syria's long and extremely narrow coastline transforms into an abrupt chain of mountains and isolated plateaux. This is a breeding ground for age-old mini-nations intent on staying that way. The plateaux are home to pockets of minorities, including Alawites, Christians, Kurds and Druze – not forgetting the Alawite heretic Assassins (http://www.outremer.co.uk/assassins.html) - all of them having a marked traditional hostility towards any outsiders from the Mediterranean west, and any would-be local rulers to the east. These mini-nations were and are always ready to collaborate and bargain with any force or group which can guarantee their prosperity and survival. Whenever needed – and for decades – they can hunker down and keep their powder dry. Whether the French colonists, Israeli aggressors or al-Assad's Damascus totalitarian regime, it has always been impossible for them to beat the Mountain Fighters. Stratfor, for reasons we could call “diplomatic and historical niceties” treats the Sykes-Picot era, and the Versailles Treaty series of negotiations of 1917-23 which “carved up” the ex-Ottoman Empire with an eye to oil resources known at the time, as historically serious, and not a game of influence trading between a large range of powers and factions. Necessarily, the fleeting agreements and resolutions on future nation states in the region, made in 1917-23, were sooner or later denied and rejected by the powers and factions that agreed them, over 90 years ago. Syria was a classic example of this influence trading. From the moment the French took Mandate power over the country they tried to create, they were opposed on the ground, by the armed factions and groups who considered they were unrightful losers – and knew what to do about it! Heresy to the al-Assad regime, of course, one of the few solution to the Syrian crisis is to revert to the historical City State model. This model was in fact the origin of Damascus and its comfortable, mostly peaceful economic wherewithal, for centuries. Set in the desert oasis of the river Barada, Damascus is protected by two mountain chains and long stretches of desert to the east, easy to defend as a city state and trade center. For almost all of its existence, it was a city state. Damascus is essentially a fortress city and a logical place to make the capital – of a limited and logical hinterland. In the Sykes-Picot world this was not enough. Damascus, to be a capital worthy of regional respect, needed a land corridor running across the mountains to the Mediterranean ports along the ancient Phoenician and modern-day Lebanese coast, and a northward route across the semi-arid steppes, to Aleppo – already a continuously claimed Turkish city, for centuries. For analysts like Bhalla of Stratfor, the disputed territory is “relatively fluid territory, making it an eas(y) place for a homogenous population to coalesce”, but this contradicts all reality on the ground. Aleppo sits at the mouth of the Fertile Crescent, and was always a natural trade corridor between Anatolia to the north, the Mediterranean to the west and Damascus to the south. The Versailled Treat series, by bundling Aleppo into an imaginary nation-state, was a red rag to a range of well-armed and determined local “players”. Aleppo, and linked city states like Homs have historically been always vulnerable to Anatolian Turkish power, and always used this fact to play ally-or-rebel with and against the Damascus city state. Apart from the coastal strip, which is all “Syria” means, lies vast stretches of desert, forming a wasteland between Syria and Mesopotamian Iraq. This desert has long been traveled by small, nomadic bands of men -- from Bedouin caravan traders to contemporary jihadist bands from the urban ghettos of Europe – travelling light with no big ambitions. The above-cited Stratfor briefing is able, here and there, to actually say this. It does not call this a new American “shale oil insight” driven by increasing energy independence of the US, nor explain that even during the Versailles Treaty series of 1917-23, on several occasions, the US either boycotted the conference that was under way, or published a dissenting and opposing memorandum to what was decided by other participants. Several of them, like Japan, had little or no real national interest in the carve up of the ex-Ottoman Empire. They were grandstanding, only. At the time, and again by 2020 or before, the US was a net exporter of oil. Why would it be vitally interested in oil resource endowments and production potentials in the region? Other than oil, what was the vital interest of the region, for external powers? From the start of the series, both pre-revolutionary and post-revolutionary Russia opposed the treaty series and the all-new nations that were cobbled. Turkey opposed the series so violently they directly sparked the Young Turks revolution, and could very easily have led to Turkey relaunching World War I by repudiating all armistice treaties and agreements. Italy considered it was so cheated and short-changed by the series that national opinion – seeking revenge - was primed for Mussolini's internal fascist revolution and takeover. All regional affected political entities, notably in future Syria, Iraq, Jordan and Egypt rejected the Versailles Treaty series. Jewish militants in the future Israel rejected the series. The Palestinians rejected the treaty series. Iran rejected the series. The Kurds violently rejected the series. The Druze refused to take any part in the conferences – and so on. Today, we are told by Stratfor that a leftover-hangover from that period – called Syria – must be saved or protected. Why is this?